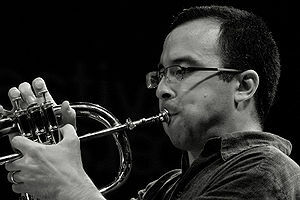 Taylor Ho Bynum is a composer, cornet player, and bandleader. Bynum currently leads his Sextet and 7-tette, and works with many collective ensembles. His endeavors include his Acoustic Bicycle Tours (where he travels to concerts solely by bike across expansive regions like New England or the West Coast) and his stewardship of artist-driven non-profit organizations like Anthony Braxton’s Tri-Centric Foundation. I’ve never heard much about your early days. How did you originally get interested in music, and how did you end up where you are as a musician? I was born in Baltimore, but grew up in Boston. Neither of my parents were musicians, but both really loved music so I was going to concerts from a very young age. My father was into Handel, Haydn, and chamber music, but also was a jazz fan (his cousin married the obscure but important bebop guitarist Bill DeArango, and he lived with them for several years growing up). My mother was an opera fanatic, and would often house opera singers, and several of them, such as Lorraine Hunt Lieberson and Lisa Saffer, lived in our home for many years and were part of the family. So from an early age, I understood that music could be a profession, something to be pursued seriously. I started playing trumpet at ten years old, and by high school I was a pretty competent orchestral player, performing with local youth orchestras on repertoire like Bartok, Stravinsky, and Mahler. But my real breakthrough happened by accident. When I was 15, my high school had cut back its music program and dropped the jazz band, so a friend of mine invited me to join a local university’s big band that was taught by Bill Lowe, who became my first mentor in creative music and a life-long friend and collaborator. At the time (late 80s/early 90s), jazz pedagogy in Boston was very dominated by the Berklee/young lion aesthetic, which never particularly interested me. Stumbling across someone like Bill, who is really a master teacher, and who combined experiences with Frank Foster and Thad Jones with Henry Threadgill and Muhal Richard Abrams, was really a life-changer for me. So while still in high school, I started leading some bands, I organized a weekly gig at the ice-cream store where I worked, I started gigging around a little bit. By the time I got to college at Wesleyan University, I was pretty sure I wanted music to be a major part of my life. That’s where I first met Anthony Braxton, which was obviously a transformative experience, along with other great faculty like Jay Hoggard and Pheeroan akLaff, and great peers like Evan O’Reilly, Steve Lehman, Chris Jonas, Guillermo Brown, James Fei, and Tomas Fujiwara (who didn’t go to Wesleyan, but we brought him in as a ringer). So by that point, I was really committed to making creative music. Navigation is your latest release, and encompassing four CDs, it is quite an effort. How did this recording come about, and how does it compare to your earlier recordings? There’s a basic contradiction in recording improvised music that we usually ignore. We (myself definitely included) have a tendency to fetishize recordings that are essentially frozen moments of improvisational creativity. By releasing so much material in tangibly different formats, I wanted to make listeners aware of that, I wanted each experience of listening to this music to be as different as possible, I wanted to replicate the live experience of exploration and surprise. I’m happy if listeners have a favorite moment they return to, but I’d prefer them to listen to all four albums, with a different experience each time, than listen to one thing over and over again. I’m very fond of all the recordings I’ve released, but I think Navigation is special; it’s certainly the largest thing I’ve yet done as a leader. And as a composer, I feel like this piece and this ensemble have been a breakthrough for me. The balance between composition and improvisation has always been the primary generative tension in my work, but in Navigation, for the first time I’ve really completely let go of trying to predetermine how we use the composed materials. I leave that up to the creativity of my collaborators and the musical demands of the moment. It makes each iteration of the composition completely unique, totally surprising to me, while maintaining a consistent identity as a body of music. This only works because I have such amazing musicians to work with, people I can trust completely and who consistently thrill and surprise me: Bill Lowe, Jim Hobbs, Mary Halvorson, Ken Filiano, and Tomas Fujiwara, with Chad Taylor joining us when possible. I’ve worked with these artists in so many different contexts over the past two decades, they really represent my entire musical history and so much of my musical family. The Tri-Centric Foundation has quietly released an enormous volume of Anthony Braxton’s works. What is your role in this organization and how happy are you with its progress? I’m currently the executive director of Tri-Centric, this has been one of my primary endeavors since we relaunched the organization almost four years ago. It’s a tough period for any grassroots arts organization, but we’ve got a fantastic team of people working together to make this happen, people who really believe in the fight for non-marketplace creativity. I’m incredibly proud of what we’ve accomplished: both in securing Braxton’s creative legacy and in supporting a larger community of creative musicians. I think Anthony is one of the most important creative figures of the past fifty years, so to have a strong organization supporting his vision and his large-scale projects is just crucial. The website and the record label, the festivals, the first studio recording of one of Braxton’s operas; these couldn’t have happened without a dedicated team. I’m just as proud of the work we’re doing supporting the larger community of creative musicians (which is such a big part of Anthony’s legacy), as we start commissioning and presenting more emerging and mid-career artists, using Tri-Centric’s resources to give different kinds of opportunities to deserving artists. I’m very excited about the festival we’ll be presenting at Roulette in April 2014; it will really highlight everything we’re trying to do as an organization. Any plans for another bicycle tour? I try to listen to as much live music as possible, when I’m at festivals I always try and check out as much as possible, and luckily in New Haven there’s the great concert series at Firehouse 12. For recorded music, I’ll go through different phases, often inspired by what I’m working on or what I recently heard live. For instance, since I just wrote an appreciation of Kalaparusha, I’ve been spending a lot of time revisiting early AACM material, that stuff stays so powerful and so inspiring. I saw a great concert of Brandon Ross’s group featuring Ron Miles at Willisau this summer which got me into a serious Ron Miles phase, his own stuff and Wayne Horvitz’s Gravitas Quartet. Same thing with Gerald Cleaver’s Black Host, I saw them at Firehouse 12, amazing show, also Tim Berne’s Snakeoil, Craig Taborn’s trio, Amir ElSaffar, all stuff I saw live recently then I dig into the recordings. I’ve been checking out a lot of Cuong Vu recently too, especially with Stomu Takeishi on bass. I also try to keep up with what my friends are doing: things I’ve been listening to recently include Mary Halvorson, Alexander Hawkins, Paradoxical Frog, Michael Attias, Myra Melford, Nicole Mitchell, Josh Abrams, Nate Wooley, etc etc. So much good music out there, it’s hard to keep up. And I always listen to tons of Ellington. How many ensembles are you a member of now, and what is the status of each? With the arts economy the way it is, it’s difficult to gauge what a project’s ‘status’ is. Five shows a year makes something a working band. Sometimes, a project might not happen for a couple of years, then all of a sudden it’s a two-week tour. That being said, I’m trying to focus my attention as a leader on my Sextet/7-tette and my bike tour. I have a habit of overextending myself, so I’m trying to keep it to that for 2014. I’d love to have some more gigs for Positive Catastrophe or SpiderMonkey Strings, but those are pretty large projects (10 and 8 pieces), so for now they’re on semi-hiatus. I also did this Prince Project last year; I’ve renamed that band Tabloid and I’d love to expand that into a multi-media theater piece, combining the Prince arrangements with original material, but that’s in the future. And I still do some sideman gigs, though less than I used to. Anthony Braxton’s ensembles of course, also Jason Kao Hwang’s Edge with Ken Filiano and Andrew Drury, Mike Reed and Jason Adasiewicz’s Living by Lanterns (fun NYC/Chicago connection), John Hébert’s Sounds of Love Mingus project with Tim Berne, Fred Hersch, and Ches Smith. Luckily, I’m at a point where I’m really excited about all the projects I’m currently playing with, however often (or rarely) they work. What do you have coming up in terms of tours and releases? It’s been an intensely busy year so far, so I’m actually going into a bit of hibernation for the next few months, in preparation for a couple big 2014 projects: the Tri-Centric festival in April (featuring the premiere of Braxton’s next opera, Trillium J), and my West Coast Acoustic Bike Tour in August/September. I’ll also be touring Europe with Braxton’s group and my sextet in May, but nothing Stateside on the books as of yet. For releases, in addition to Navigation just coming out, the last six months also saw new records by the Book of Three, the Convergence Quartet, and a duo DVD with Braxton, so I’ve probably more than glutted my limited market appeal. The only release I’m currently planning for 2014 is my next duo recording with Tomas, called Through Foundation. We’re celebrating 20 years of making music together with a really beautifully designed, limited edition vinyl release, that will be out early in early ’14.